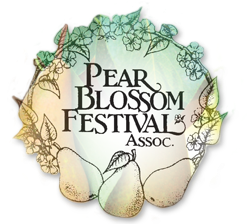 The Board of Directors of the Pear Blossom Festival Association and members of the Medford Rogue Rotary invite you to participate in the Third Annual Pear Blossom Bike Event – Pedals ‘n Pears (PnP). Since 1954, thousands of festival-lovers have cherished the Pear Blossom Parade and associated events. The Rogue Credit Union Pear Blossom Festival is many events under one big umbrella, including the Junior and Senior Royal Courts competitions, the Smudgepot Stroll, the Pear a Fare, the Street Fair, 2-day Golf tournament and of course the Pear Blossom Parade sponsored by Lithia Auto Stores! © 2015 Pedals N Pears - Pear Blossom Bike Ride in Medford, Oregon.